Ambivalence gets a bad rap. When people say they feel ambivalent about something, they usually mean they are unconvinced by it, that they don’t feel strongly enough one way or the other to endorse or condemn it. But the roots of the word – the Latin for “both” and “strength” – suggest something a little less easily dismissed. In chemistry, a valence bond occurs when two or more atoms feel compelled to share electrons in their outer orbit, strengthening their stability and forming molecules -- and eventually all the stuff in the universe. This quantum imperative may explain why we humans have such a deep-seated craving to resolve situations and perceptions into singular, unambiguous meanings – why ambivalence implies mixed feelings too weak to bother sorting out instead of simultaneous strengths -- oriented in different directions -- that forcefully resist our efforts to categorize them. One of the great strengths in the work of Alex Gross is his willingness and ability to articulate a space populated by an array of powerfully charged symbolic elements without allowing them to coalesce into easily pigeonholed molecules of meaning. The meaning is there – or rather meanings – hovering just out of reach: potential narratives of geisha girls in zeppelins with skeletons, surfboards, cell phones, and snakes forever kept from collapsing into certainty by Gross’ rigorous refusal to dictate the one correct interpretation . The result is a sort of cavernous pictographic architecture built to contain the mysterious void that stretches between units of significance – and to keep at bay the comforting torrent of verbosity always waiting to plug the gap. Resisting the desire to rationalize the mysterious is just as much the job of the viewer, and try as we might, it is impossible to at least entertain one or two species of interconnective material that might explain the confounding pictorial admixtures with which Gross confronts us. 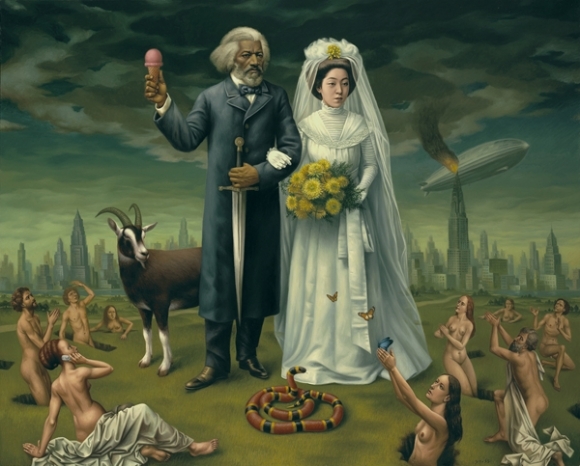 19th-century African-American abolitionist Frederick Douglass stands with his hitherto unimagined Japanese bride, clasping a sword and holding aloft a strawberry ice cream cone that appears to be triggering a mass resurrection of the dead; in the distance, a zeppelin crashes into the Chrysler Building. Clearly the chickens have come home to roost for white technocratic America. À la mode! Or something. The indeterminacy of individual symbols – some are randomly or unconsciously chosen; some are specific art historical or pop cultural references; some are from Gross’ personal life: people he knows or singular images he’s collected – as well as the ambiguity of their potential connectivity, make his canvases a kind of interactive game – one that’s different for every player. One viewer may recognize Rogier van der Weyden’s Beaune altarpiece as the source of some of the resurrected corpses in Gross’ 2007 version of “The Last Judgement” described above. Some one else might have no knowledge of the Flemish Primitives, but know which member of Kiss is depicted (or his makeup at least) in 2008’s mixed media collage “Videotape” (2008) or recognize the Louis Vuitton handbag in “Obedience” (2009?) – a nod perhaps to the controversial LV boutique embedded in LA-MOCA’s spectacular 2008 Takashi Murakami survey. But then sometimes a handbag is just a handbag. The point is that Gross neither micromanages our hardwired desire for clear-cut linear explanations nor asks us to abandon it altogether, but engages with it in a sort of personalized push-pull choreography of shifting potentialities, a sort of brain massage that finally leaves us a little more comfortable with not knowing than we were when we started. And we may also notice a structural similarity between the attractive charge that tries to draw symbolic units into coherence and our own cognitive relationship to the puzzle before us. And so this architecture of mystery may extend out from the canvas and -- for as long as we remain in this state of suspended judgment – include us as a player in its matrix of potential meaningful relationships. This is to some degree how all art – or at least all good art – functions; by presenting something mysterious and inviting you to participate in it. But in addition to the deliberately composed semiotic equilibrium described above, Gross’ work strips down, reinforces, and systematizes this strategy in several ways. There is his craftsmanship – diabolical hornets-nest of controversy that that topic is – which carries with it an implication of precision and the valorization of pictorial verisimilitude – our shared external reality rendered in as illusionistically persuasive a manner as possible -- as the most widely embraced visual lingua franca of our species. So most viewers approach Gross’ work with an openness they might not afford your typical Jackson Pollock or Marcel Duchamp; the particularity and legibility of the imagery assures them that whatever information is to be conveyed, it will be clearly communicated in a familiar symbolic system that carries no hint of exclusive elitist jargon. It’s not a trick. Except it kind of is. This is the same strategy employed by the fantastic realism strain of Surrealists – de Chirico, Magritte, Dali, et al – to somewhat different ends – exposing representation’s potential for deception, or manifesting the Freudian unconscious in the virtual reality of figurative illusionism, or whatever. Gross’ work is an empty Trojan horse; the message is “There’s no message.” Unless there is. Other broad spectrum attractors at work in Gross’ paintings include the sheer beauty of his subjects – striking, haunted, enigmatic faces from alien eras, framed by ornate and exquisite garments, accompanied by butterflies, peacocks, bluebirds, spotted deer, billowing clouds, and blossoming cherry trees. What’s not to like? Gross’ employment of classical pictorial templates such as crucifixions, last judgments, and wedding portraiture recall a time when oil paintings were the primary popular record and medium of mass communication, and his incorporation of design elements from movie and theater posters, brand logos, commercial packaging, and print advertising point to our contemporary shared visual vocabulary and its arena. Both these components suggest that some indoctrination, persuasion, or at least friendly advice is embedded in the optical pleasures proffered – no supper without a sermon, right? Wrong again. Part of what attracts me to Gross’ work is the undidactic skepticism about contemporary corporate-dictated mass culture and its effect on humankind that he allows to manifest through some of his pictorial choices and occasional combinations thereof. While I have no doubt that Gross’ concerns about globalization extend to outsourced slavery, toxic avengers, etc., the primary symptom addressed in his artwork is the impact of media centralization on the both the content and structure of our visual environment – as well as the consciousness that perceives it. And this is the content, structure, and reception of his portion of the visual environment where Gross is taking a political stand. Although Gross allows patchwork allegorical critiques to take rough form – the pointed and relentless intrusion of cell phones as an indicator of the spatio-temporal fragmentation and physical alienation imposed by digital communication culture, for example -- the colonization of the imagination is the only aspect of globalization that can be countered directly through visual art, and it is on this disputed real estate that I would locate Gross’ political and art historical significance. Because at this point in history, what Gross’ enigmatic rebuses interfere with is a completely articulated field of symbolic representation, with no vacant lots, no wild patches, and no commons -- where all roadsigns refer to Rupert Murdoch. A space so glutted with literality, there’s no place from which to stand and consider it. Yet even at this level, Gross’ work cannot be said to be unequivocal. Like many of its undesirable effects, globalization’s overstuffing of the sausage of human imagination may well be just an accidental byproduct of its single-minded pursuit of Mammon. And, like many of its undesirable effects, this one will ultimately undermine its own generative mechanism: because when there is no space left across which to yearn, there can be no desire, and without desire, nothing moves -- we arrive at an absolute zero of the soul, and sales go in the toilet. Gross’ semiotic abstinence and restraint make capitalism safe for democracy again, or at least offers to. Ultimately, though, it’s about painting -- the negative capablility impact of Gross’ ambivalence depends on the simultaneous readability of all his symbols – an experience which is only available in still pictures. Classical pictorial templates (as well as those of contemporary graphic design) were part of the mechanism by which cultural content – particularly the proportion of surprises and symbolic ambivalence -- was strictly regulated. But because pictures are fundamentally ambivalent, the old masters were always able to accommodate mystery. It is this ancient visual technology, and its irreproducible subjective psychological applications -- seen in the works of Fra Angelica, Rogier van der Weyden, Richard Lindner, George Tooker, and a thousand more (maybe even Pollock and Murakami) -- for which Alex Gross’ paintings stand in affirmation. And every time you stand in front of one of Gross’ paintings and relax your connect-the-dots jones – it is in this no-man’s land you are invited to stake a claim. Or not. It’s up to you to not make up your mind.